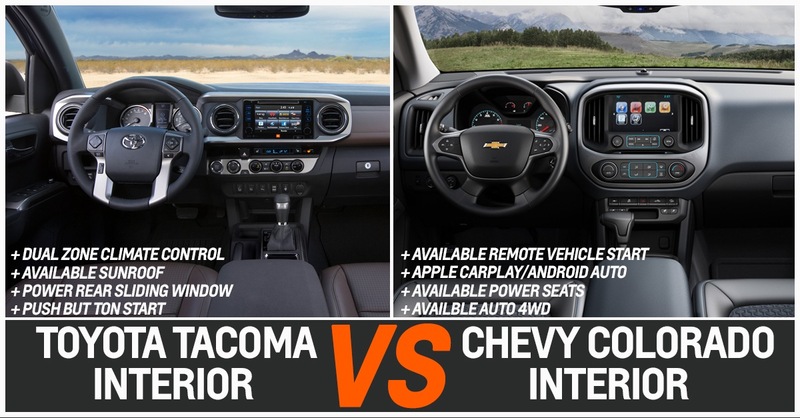 Wallace Chevrolet > Android Auto > Toyota Tacoma versus Chevy Colorado – Which is Best?! 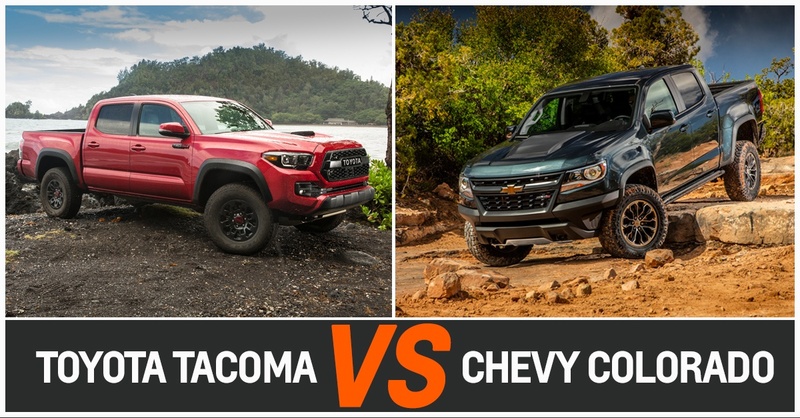 Toyota Tacoma versus Chevy Colorado – Which is Best?! If you’re searching for a new mid-size pickup you’re likely shopping the 2017 Toyota Tacoma and the 2017 Chevrolet Colorado. 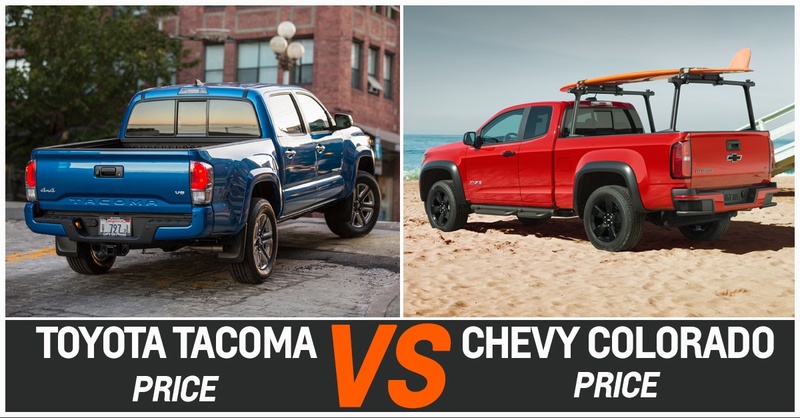 So…Which is the better truck? 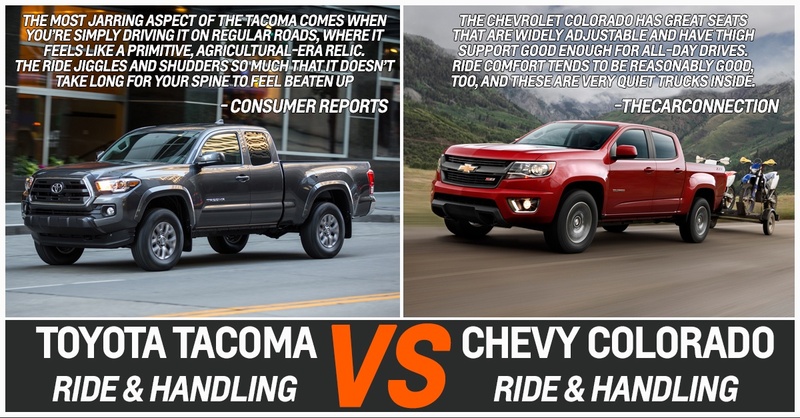 Check out our Toyota Tacoma vs Chevy Colorado test and find out below! 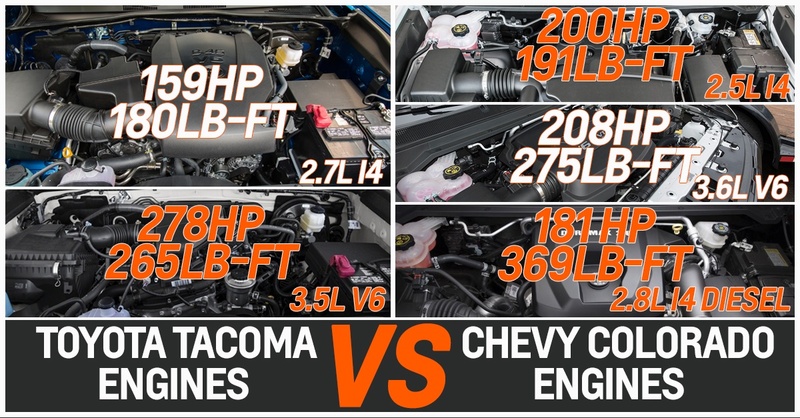 ROUND 1 – POWERTRAIN The Toyota Tacoma is available with two choices of powertrain (four-cylinder and six-cylinder engines), while the Chevrolet offers three engines including a segment-exclusive 2.8L Duramax diesel engine! The new diesel engine offers both best-in-class fuel efficiency and best-in-class towing, returning up to 9.6L/100km (2WD & 4WD) and a tow rating of up to 7,700lbs! Whether it’s fuel efficiency or towing power, the Colorado takes the win! ROUND 2 – INTERIOR It’s no secret: Both trucks offer buyers a selection of new technology, easy-to-use controls, a large greenhouse for excellent visibility and various ways to connect your smartphone- but that’s about where the similarities end. The Colorado offers a plush interior with materials, seats and a MyLink infotainment system that’s several notches above the Tacoma. The Colorado also gets a host of new technology unavailable on the Tacoma like Apple CarPlay & Android Auto, which allows smartphone users the ability to seamlessly mirror their phones on the vehicle display. From answering and receiving text messages, finding directions to nearby hotspots, playing your favourite music and more…it’s all possible with Apple CarPlay & Android Auto! The moment you hit the streets it’s clear the Chevrolet Colorado is far more at home on pavement, soaking up bumps with a smoothness normally reserved for mid-size sedans. The engine operates smoothly and the outside world is generally kept, well, outside. The reviews agree, too: The Colorado is more palatable- even downright comfortable – if you spend much of your time in the city. 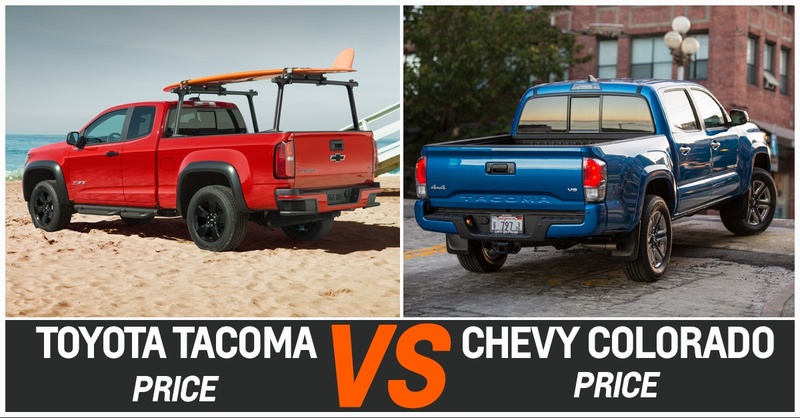 When it comes to Toyota Tacoma vs Chevy Colorado, this could well be the deciding factor! For some buyers it all comes down to one factor: price. What do you you get for the money? In Canada, the Chevrolet Colorado starts at a reasonable $22,130 (MSRP) for a 2WD Extended Cab. Stop up to the top-of-the-line Z71 Crew Cab V6 model (4WD), with 8-inch MyLink touchscreen, 8-Speed Automatic Transmission, Remote Vehicle Start and Heated Seats, and you’ll pay $40,101 (MSRP). Step over to the Tacoma and you’ll also shell out $29,660 for the base model 2WD Access Cab. Move up to the top-of-the-line 4×4 DoubleCab V6 Limited model, with 7-Speaker JBL Sound System, Heated Leather Seats and Blind Spot Monitoring, and you’ll shell out $45,735.